This 18-story white-brick building with 94 apartments was built in 1960 and converted to a cooperative in 1986. 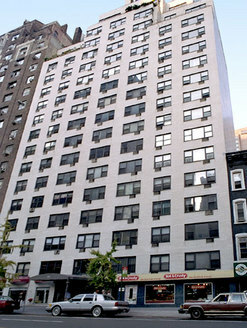 The building's East Midtown location is convenient to Midtown offices, Central Park, Madison and Lexington Avenue shopping and restaurants and all public transportation. Please upload Cover Letter. For more information please see attached document. Complete Financial Statement and Itemized Schedules-3 pages(enclosed).Please note excel document must be maximized in order to view all schedules. To be submitted along with all supporting documentation. Upload bank reference letters on each applicant. Upload Employment verification letter on each applicant,stating position,salary and length of employment. Upload three(3) business reference letters on each applicant. Upload complete copies of federal tax returns and W-2 forms for the past two years. Complete the tenant Data Verification Co.Inc.and Authorization to obtain a Criminal Report Form(both enclosed). Lead Based Paint Disclosure Forms (enclosed): The disclosure documents must be completed in their entirety and submitted for review with the Board Package.The Board Package will not be sentto the Board of Directors unless the Lead Based Paint Disclosure documents are included. NO EXCEPTIONS will be made.Enclosed is a summary of the Lead Based Paint Disclosure Information. Please upload: 1. Loan Application, 2. Commitment Letter, 3. Three (3) AZTECH form of Recognition Agreements (originals) signed by an officer of the lending institution and applicant(s) (enclosed). Please upload the cover letter. For more information please see attached document. Please complete the Sublease application (enclosed). Statement of Financial Condition (enclosed). Please Fully Execute sublease agreement. Upload Three letters of personal reference. Upload Letter from employer stating position, salary, and length of employment. Upload Current landlord reference letter. Upload Last years W-2 form. Tenant Data Form and Authorization of Criminal Report Form (both enclosed). Local Law 1 Lead Form (enclosed). Fire Safety Plan Building Information (enclosed). The disclosure documents must be completed in their entirety and submitted for review with the Board Package. The Board Package will not be sent to the Board of Directors unless the Lead Based Paint Disclosure documents are included. NO EXCEPTIONS will be made. Enclosed is a summary of the Lead Based Paint Disclosure Information. Please refer to section B in the attached file for more information. Letter from shareholder outlining intent, including particulars of present financing situation. If shareholder presently holds a mortgage, what is the amount, length of loan, interest terms, etc. What is the purpose of the refinancing? Will the existing loan be paid off, etc. Copy of fully executed Loan Application. Copy of the Commitment Letter. Please refer to section A in the attached file for more information. Financial Statement and Itemized Schedules - 3 pages. To be submitted along with all supporting documentation. Please upload a letter addressed to the Board of Directors requesting to renew the existing sublease. If the apartment is financed the shareholder must obtain their lender’s written consent to sublet. If the apartment is not financed, the shareholder must provide a notarized letter stating that fact. A Sublease Agreement, signed by both parties (enclosed). The co-op has no flip tax and the board allows pied-a-terre, co-purchasing, cats, and small dogs on a case-by-case basis upon approval.